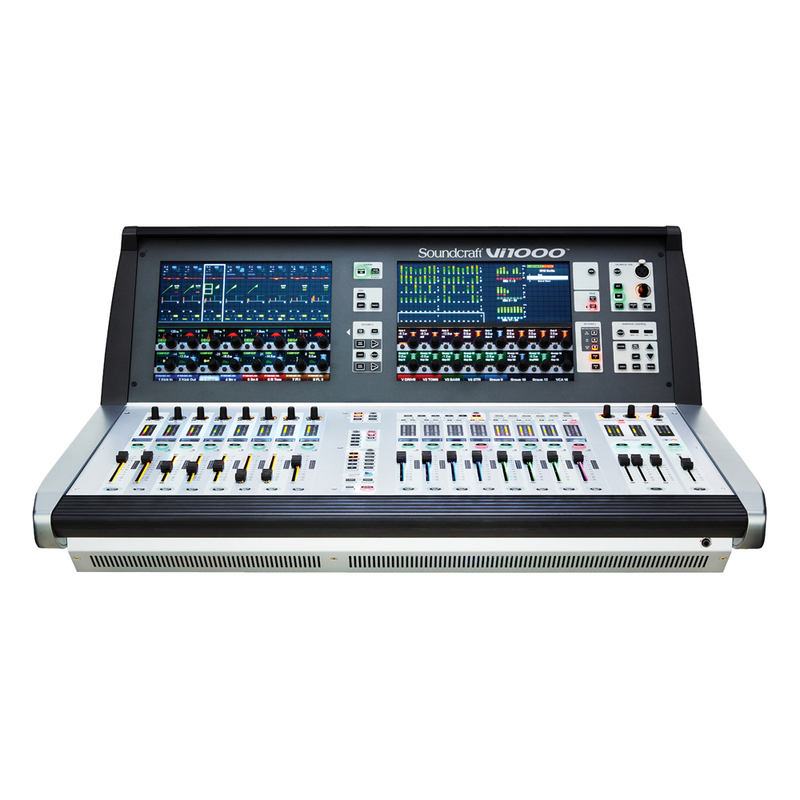 The Soundcraft Vi1000 sets a new standard in live mixing power and performance in a compact footprint. The console is the smallest member of the Vi-000 family, at just 86cm x 81cm (34” x 32”) in size, yet it retains all the mixing and processing power of its two larger siblings, the Vi2000 and 3000. 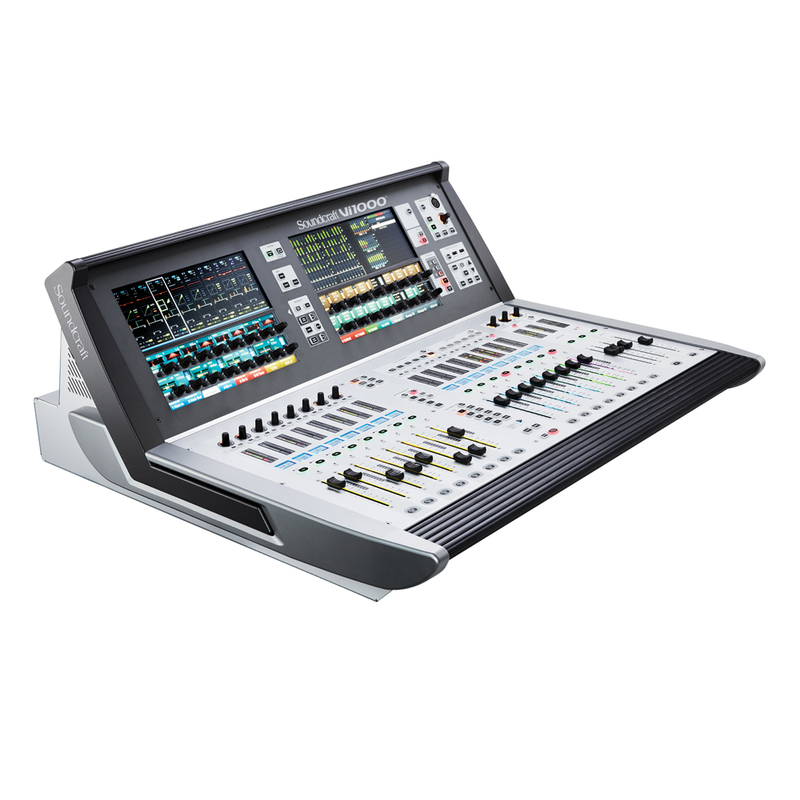 The Vi1000 is aimed at the live touring, install and corporate AV markets for applications where a highly compact, cost-effective but powerful console is required. Employing Soundcraft’s unique and highly intuitive Vistonics IITM channel strip control interface, together with FaderGlowTM, the console inherits the operating principles and workflows from the highly successful Vi3000, 5000 and 7000 consoles. In addition, it also integrates Soundcraft® SpiderCoreTM - a powerful integral DSP and I/O engine based on STUDER technology, offering 40-bit floating point processing for class-leading audio quality. The Vi1000 also comes into its own as an additional remote-controller surface for any of the larger consoles in the range, using the Mirroring feature. In addition to the standard gates and comps on all channel paths, audio processing includes the acclaimed BSS DPR901ii Dynamic EQ (8 instances) via an insertable processing pool which also includes 4 Lexicon Multi-effects and the ability to insert up to 64 external devices. STUDER vMIX automatic microphone mixing comes as standard and BSS 966 graphic EQs are available on all output busses. 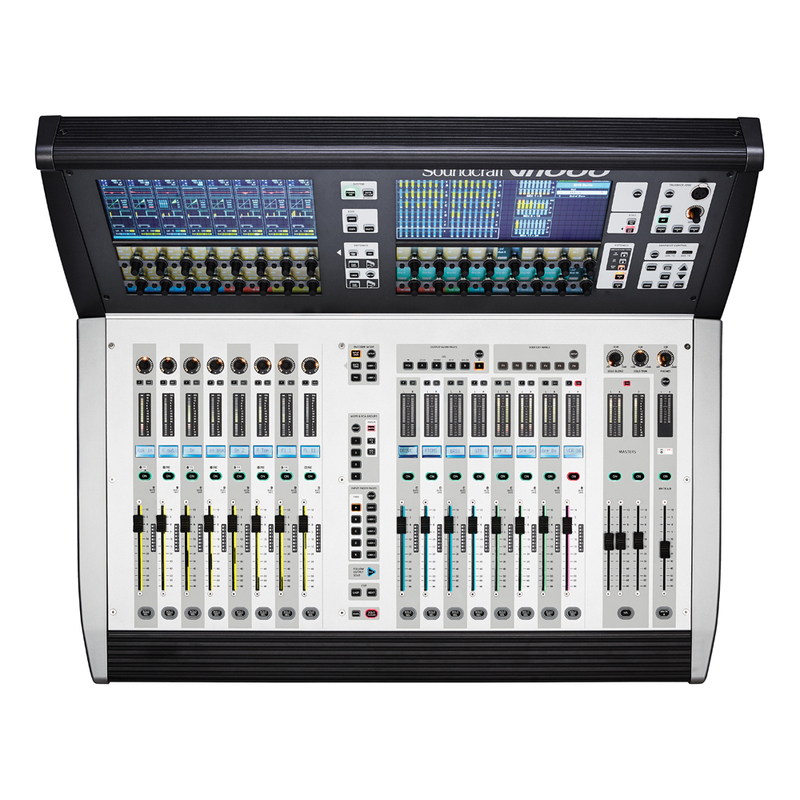 The Vi1000 comes with rear panel local I/O featuring 16 mic/line inputs, 16 line outputs, and two 64ch expansion slots allowing up to two MADI-based stageboxes to be connected, or alternatively access to the extensive range of D21m I/O option cards, addressing all industry standard audio formats. A built-in 64x64ch Dante/MADI interface provides direct recording/ playback connection to any PC or Mac-based recording software, and allows the Vi1000 to integrate into an existing Dante network. 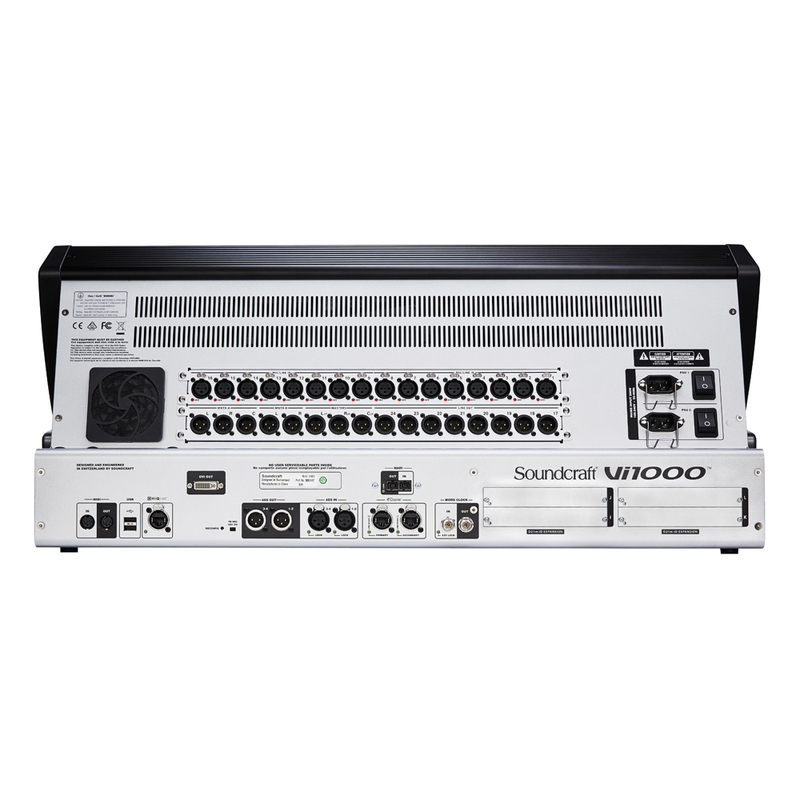 The optical MADI interface allows an alternate record feed to MADI-based storage devices or connection to the Soundcraft Realtime Rack Plug-in engine, adding a suite of Universal Audio UAD-powered plug-ins to the Vi1000’s pristine audio quality. 4 channels of AES/EBU I/O complete the back panel, bringing the total I/O count to 212 in, 212 out. The 128 tie lines facility allows any I/O connector to be split or linked to any other. New with Vi1000 is compatibility with Sennheiser 6000-series wireless microphone systems, adding to the existing AKG WMS/ DMS and Shure ULXD/QLXD monitoring and control functionality. This powerful feature allows users to see status of battery, RF and other parameters of connected microphones directly on the channel strips—in combination with vMIX dialogue Automixing and BSS Dynamic EQ, this makes Vi1000 an ideal tool for conferencing and theatre work. Another new feature allows input channels to be easily spread across all of the Vi1000’s 8 input and 8 output faders, giving easier handling of complex mixes. 2, switched, for redundant PSUs.